Blendtec Fourside Jar experiences and details with all tips and tricks! The Blendtec Fourside Jar was Blendtec‘s first jar ever and is til this day the most used one. It is the smaller one of both standard jars. When it came out, the FourSide jar revolutionized the world of commercial blending. Its square shape is much better at blending than traditional round jars. It holds up to 32 ounces or 4 cups with a total volume of nearly 2 quarts. Durable BPA-free copolyester material will stand up to heavy use, that is Blendtec‘s standard for all their jars. The jar also generates more friction, heating soups a little faster than does the WildSide jar. It’s also especially good for dry grinding and making smaller smoothies. Even bread dough and sauces are easily made with the Fourside Jar. There is nothing it cannot do. 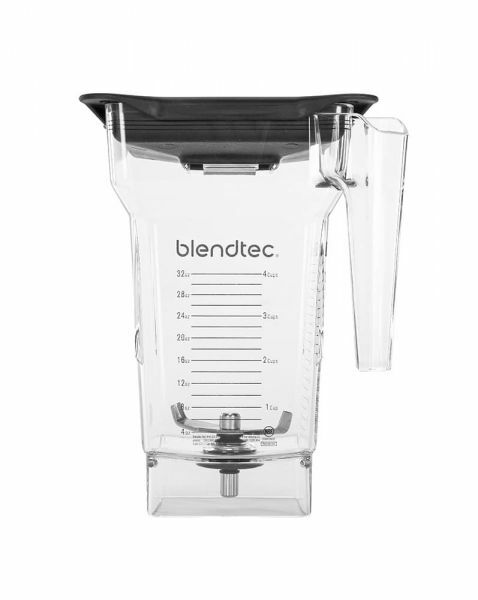 The standard jar for the Blendtec Classic 575 (compatible with all Blendtec consumer blenders) has a very convincing price/performance-ratio. This question is often asked: How to clean my blender jar quick and easy. You want your jar to look nice and clean for many years, so here are a couple of tips for you. Scrape out all the delicious food you’ve just made. Fill the jar with 1 to 1½ cups water and 1 to 2 drops of soap. Secure the lid. Press “Pulse” a few times. Wash in the sink with soapy water. Place the jar on the top rack of your dishwasher. Do not run on the heat setting. We recommend to clean your jar at least once a week like this, with soapy water, so you will enjoy your jar for a long time! Related links to "Fourside Jar"
Customer evaluation for "Fourside Jar"